Knives are available with a 45° angle. Cutting edge length 4, 6, and 8mm. The knife is designed for the sectioning of hard and soft biological and industrial materials, non embedded or embedded in methacrylate or epoxy resins. 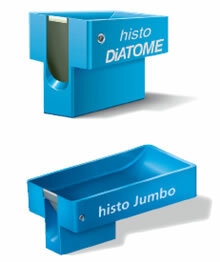 The histo knife may be used on all ultramicrotomes and microtomes with a retraction of the specimen in the return phase. For the production of our histo knives we use natural diamonds of highest quality. They guarantee the best quality and durability of the cutting edges. Perfect sections, free of scores or compression. Serial sections without knife change. Extreme durability of the cutting edge. For 3D reconstruction it is imperative not to lose a single section (Ref. Blumer). Knives are available in 45° angle. Cutting edge length 4, 6 and 8mm. 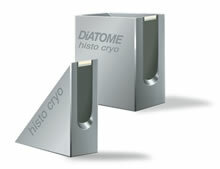 The histo-cryo knives are delivered in boats (for wet cryo sectioning) and triangular holders (for dry cryo sectioning), made of a special copper/nickel alloy, which guarantees the best heat/cold transmission. O.L. Reymond: The «semi» diamond knife: a substitute for glass or conventional diamond knives in the ultramicrotomy of thin and semi-thin sections. Bas. Appl. Histochem. 30, pp. 487-494, 1986. M.J.F. 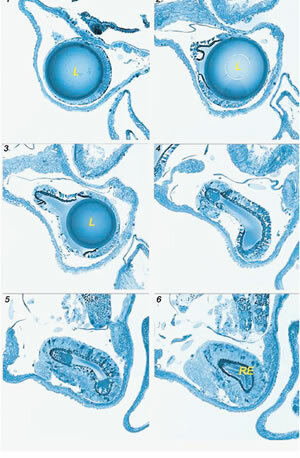 Blumer: Development of a unique eye: photoreceptors of the pelagic predator Atlanta peroni (Gastropoda, Heteropoda). Zoomorphology 119, pp. 81-91, 1996.